Derrick Rose scored 32 points and the Chicago Bulls beat New York 104-99 on Monday, handing the Knicks their sixth straight loss. 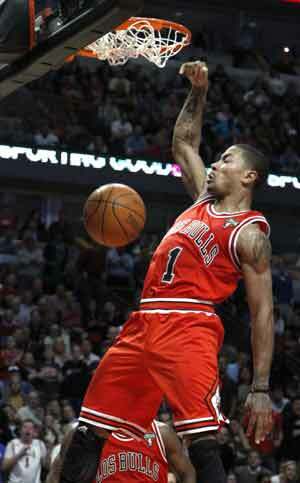 Rose shot 12 of 29 from the floor and had six rebounds and seven assists as the Bulls got their 10th win in 11 games. Taj Gibson had 15 points and a team-high 13 boards for Chicago, which outrebounded New ork 56-38. The Bulls entered the game leading the league in rebounding margin. Carmelo Anthony scored 21 points and Amare Stoudemire added 20 for the Knicks, but the two combined for just seven points in the fourth quarter as the Bulls pulled away. Jeremy Lin had 15 points and eight assists for New York, but shot just 4 of 11 from the floor and had little luck stopping Rose. The Knicks have lost six straight for the second time this season and, combined with Milwaukee's win at New Jersey, are now tied with the Bucks for the last playoff spot in the Eastern Conference. New York has lost eight of 10 since Anthony returned to the lineup from an injury on Feb. 20. Carlos Boozer scored 15 points and Joakim Noah had 12 points and 10 rebounds for the Bulls. Rookie Jimmy Butler played a key role with eight points in 29 minutes, making several big energy plays to excite the sellout crowd. The Bulls' dominance on the boards led to the key basket of the game midway through the fourth quarter. With the shot clock expiring, Rose flipped up a long shot that bounced off the back of the rim, but Gibson chased down the rebound, bringing the United Center crowd to its feet. Then Rose cut behind Lin, who had turned his head, took a bounce pass from Noah and threw down a thunderous, one-handed dunk to put the Bulls ahead 91-84 with 6:01 to play. A couple of minutes later, Butler put an exclamation point on his performance by roaring in from the baseline to dunk Boozer's missed shot. Anthony hit a 3 to cut the lead to four with 49.8 seconds remaining but that was as close as the Knicks got. In the third quarter, Rose capped a 12-2 run with a floater off a crossover that left Lin in the dust, giving Chicago a seven-point lead. The Knicks responded with an 11-5 spurt of their own, all of the points coming from Stoudemire and Anthony, who combined for 21 points in the third. The Bulls took a one-point lead into the final quarter after Noah hit a foul-line jumper off a feed from Butler. Noah had six points and six rebounds in the quarter. The Knicks led 50-48 after a hotly-contested first half that featured 32 free throw attempts and a pair of technical fouls, one on each coach. Chicago came out aggressive, pushing the ball up the floor at every opportunity, and took 29 shots in the first quarter alone. The Bulls hit just 40 percent in the opening half, with Rose going 5 for 15 from the floor. He led Chicago with 13 points, while Gibson added seven points and seven boards. The Knicks looked crisp on offense early but faltered as the first half wore on and the pace slowed. Tyson Chandler had 11 points and five boards before the break and Lin added eight points and five assists. New York got the final point of the first half on a technical free throw by Anthony, who had eight points and a team-high six rebounds at the half. Chicago coach Tom Thibodeau was hit with the technical after arguing a charging call against Brian Scalabrine.